I married my high school sweetheart and best friend. Boy did we look young... and we were. We have seen many things throughout our 22 years, 6 years in the Marine Corps and Desert Storm, where Ken proudly served this great nation. After the Marine Corps, we moved back home to be closer to family. We bought a house and had our two greatest blessings - Janna and Connor. We have watched our babies grow up. We then moved to Smithville 3 years ago. Little did we know at the time what a wonderful blessing this would be. Our family has flourished here in the small town. These years have been some of the best; some years have been trying, but through it all our commitment, faith and love for each other has stood the test of time. I hope we are blessed with many more wonderful years together, filled with laughter, love and each other. Love you, sweetie! I didn't realize your husband had been in the military too. Congratulations on being together for so long! That's quite a big deal for these days. Happy anniversary! 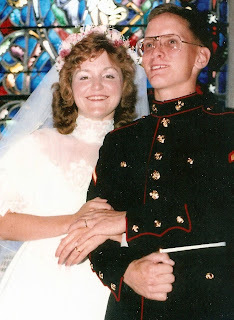 Happy Anniversary, Sheila & Ken! Your marriage has stood the test of time...and a whole lot more:) Can't wait to help you celebrate another year of wedded bliss and looking forward to celebrating your union at least 22 more times!